for John – Hello Korea ! All over Korea there are little game rooms like this one. I thought you’d get a kick out of this: traditional drums hooked up electronically to a game. It was playing some Sousa march, and the girl really knew her drumming technique. 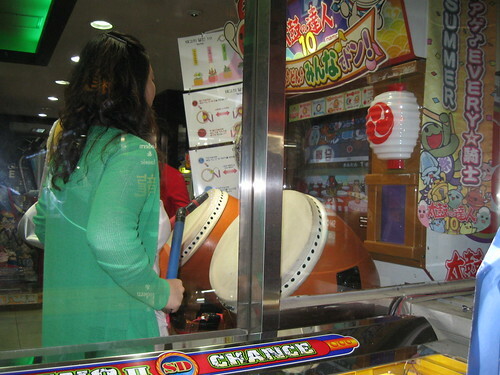 The screen has a lot of little cartoon characters who hop around from cartoon drum to cartoon drum, depending on how she plays. I have no idea how the score is kept! The characters on the game are Chinese. So maybe it’s a Chinese game? Most Koreans have to learn some basic Chinese as they are growing up, and everyone has both Chinese and English names. I’m really glad I’m not in China, as the sound of it is totally impenetrable to me. I really like the logic and order of Korean, especially as I am learning to read and understand the grammer a bit. Yeah. Chinese has almost no logic to it, although I must say the grammar is nice and simple. And it’s so sing-song and schwoopy sounding. It’s so dependent on inflection, I don’t know how anyone masters it! Cudos to you and good thing you got a head start! It can sound really pretty sometimes. But all in all it is quite pleasant and not as harsh sounding as, say, Japanese. I’m glad Korean is so logical, but it sure would be easier if its root words were not Chinese! There are several books available here that show how learning Korean is actually a great way to segueway into learning Chinese. And, since remnants of Chinese characters remain and are still used, it is a good idea for anyone really serious about Korean to take on learning some basic Chinese eventually. Baby steps for now, as I’m afraid to even say good morning to anyone! Yeah, Chinese tones are a b****. The inflections are barely emphasized at casual native conversations, but they are there and it does seem to make a difference when I don’t use them correctly. How much Korean have you absorbed so far, Suki? I have about 250 words, but I can only use at least 75-80% of them in one context, and again, depending on how well my tone usage is on that particular day, sometimes I can’t pronounce them all and my voice sounds like crap whatever amount of times I repeat myself. I’m so conscious of the tones and they trip me up so fast it’s unbelievable. It’s a challenge just to say more than 4-5 words in one go without stumbling or hesitating or saying the wrong inflection. I think I got the impression that before you went you hadn’t really studied any Korean. Well, it’s a lot harder even when you have a survival vocabulary to get the inflections right *and* keep your account comprehensible. I can still only have the cajones to say hello and thankyou. My vocabulary is anywhere from 30 to 100 words, and that is hazy. So I’d say it’s really about 6, since I can’t even begin to bring them forth when needed. I’m soooo glad I don’t have to deal with a tone language! But I hear that everyone is pretty forgiving if it is wrong, knowing that it is a foreign language for you. Anyway, good luck! Speaking practice is what you need and can’t really get in a non-immersive environment. I wish there was a Korean family I could live with here. People only speak English to me. Which right now is okay, since I have my plate full trying to make a living and adjusting to permanent residency. But at some point, I need immersion myself. I just need to find a way. Somehow. Well, maybe your sister is good at charades and acting. You can learn a lot from her: probably more than in all those years you studied. But all that preparation is at least SOMETHING. A bridge to cross.